Did you know that Fort Worth has one of the highest number of pedestrian fatalities in the NATION? Not good. 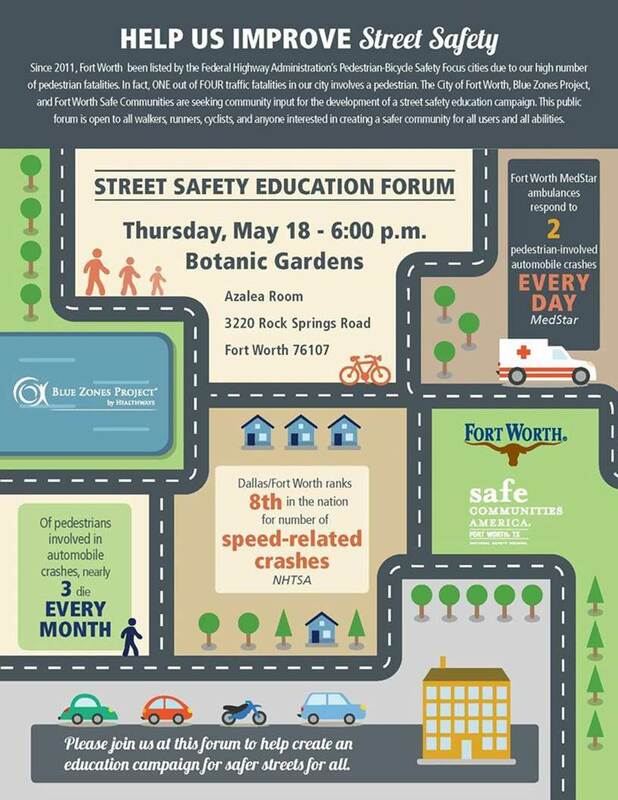 We wanted to make you aware of the collaborative effort between Blue Zones Project, Fort Worth Safe Communities and the City of Fort Worth to host a Street Safety Education Forum. The public forum is the first step in developing a street safety education campaign (think LookOutTexans.org). As we continue to work to create a healthier city, we also want to create a safe environment for ALL users of the streets not just the motorists. Please feel free to share this flier with interested entities. If you are interested in giving input on shaping the campaign we welcome you too! For more information or any questions, please contact Public Affairs Coordinator, Brenda E. Patton, at Brenda.Patton@healthways.com. To RSVP to the event please e-mail: info@fwscc.org.